You are in for a treat on Saturday, February 5th. 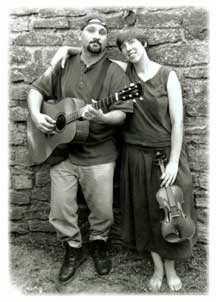 Changeling, the Irish duo will be performing at 7:30 p.m. at the Clifton Opera House. If you have not heard this group before, you will not be disappointed, they put on a fabulous high energy show. Debra and Karl Kolon combine traditional Irish reels with playful jigs so there's something for everyone. As one fan describes them, "Changeling presents the fire and stark beauty of the Celtic traditions with the power of ten in a package of two." They travel from concert halls to dance halls, delighting fans and winning friends with their tunes, songs and stories. Check out their website and learn more about this delightful duo. The Clifton Opera House is located at 5 So. Clay Street, Clifton. Please call 937.767.2343 or check our website at www.cliftonoperahouse.com. The box office opens at 6:30pm.